Ok. So there has been a lot of coverage for John Debney's LAIR around here, but there is more going on for the SONY PLAYSTATION 3 than just LAIR. The second game that has got me eyeballing a PS3 for the first time is HEAVENLY SWORD. This game is truly amazing to behold, but providing the musical texture is composer NITIN SAWHNEY. For this project he blends orchestral and electronic elements to give HEAVENLY SWORD a distinctive sound. The official game site has been releasing MAKING OF episodes for a few weeks now (along with some pretty entertaining back-story episodes as well). You can even download all of the episodes in 720p! Between this site and Bioshock's, these game sites are doing a better job ofm not only generating hype, but providing interesting insight into the game's story even better than the film studios for their projects. 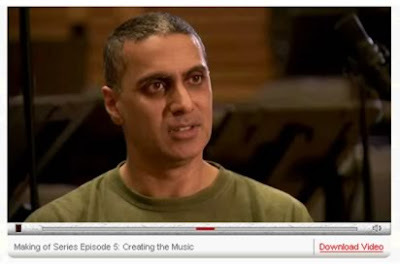 The fifth installment of the "making of" series focuses on NITIN SAWHNEY's contribution to the epic project. I'm trying hard to secure an interview with the composer, but its been no easier than getting one with John Debney. Keep your gaming-fingers crossed and stay tuned for more on the score for HEAVENLY SWORD.